Consisting of 6 tracks, "The Solace System" is in a way the follow-up EP to Epica's 2016 album, "The Holographic Principle". All tracks were recorded while the band was in the studio for their seventh opus and, according to founder and guitarist Mark Jansen, the band didn't want to release a double album but the material was too god to discard. Hence the idea of the EP was born. "The Solace System" kicks off with the title track, which was also the first single off of the record, probably one of their most unpredictable songs to date. An epic choir slowly introduces the instruments and builds tension. Lead singer, Simone Simons, comes in with a vibrant poppy vocal melody, still a bright contrast with the soaring guitar work and orchestration that supports her. As soon as the chorus hits, the track finds its usual Epica self, eventually developing an almost thrashy character branded by Isaac Delahaye's signature solo. There's something about the the song that really throws me off, and it has since it was released but I can't pinpoint what it is. I good guess would be the aforementioned unpredictability that attempts to blend bits and parts that somehow don't sound compatible. Regardless, it closes with Simons brilliantly executing a seamless transition from chest to head voice. Perfection. On to the second track, "Fight Your Demons", which I believe was previously released as a bonus track. This one is your traditional Epica concert headbanger; a ferocious composition with riveting drums, a beautiful subtle eastern melody before the solo, keyboardist Coen Janssen accentuating the intensity of the guitars and Mark Jansen "conversing" with the choir led by Simons in the right pitch. In my honest opinion, with that tempestuous spirit, it rightfully should have been in the original album. "Architect Of Light" continues the heavy legacy. The orchestra and fine vocal harmonies turn into an astounding mass that transcends the instrumentation, fervently complementing the assaulting rhythm section. For the most part, the track doesn't stray from the basic lines Epica has established in the recent couple of albums, which can also count as a downside. I get the feeling that at times some compositions heavily rely on the orchestration to elevate them. I do appreciate, however, the recurring tone pattern of the intro at the 03:30 mark. I genuinely do. Because after the thunder, the calmness of that melody never fails to give me the chills -and in a live setting, it's the perfect breather. "Wheel Of Destiny" strongly gives off Delahaye's composing mindset. A bombastic anthem that manages not to sound complex when it really is. Simone Simons interchanges her playful belting and head voice swiftly and on point despite the demanding vocal melodies. I thoroughly enjoy how this song is based on the guitars and bass to produce a solid outcome while the orchestra takes a small step back, letting those sounds develop more. "Immortal Melancholy" is the ballad of the EP, also previously released as an acoustic track. Out of all the downtempo songs they have released (or later transformed into acoustics) this one is by far among the best. It is simple yet emotional, not vocally demanding but powerfully delivered. As with the acoustics/bonuses of "The Quantum Enigma", the guitar has fully replaced the piano while Simone uses her lower register to render this dark story. One could say that in a way the song draws elements from the medieval-esque hints of "Consign To Oblivion" and blends them with the vocal minimalism of "Safeguard To Paradise". "Decoded Poetry" is the sixth and final track of the EP. Another classic Epica song, only this time the vocals don't dominate the music. After the second chorus we are greeted with lovely twists; a death metal-ish outburst that transitions into a melodic choir only to return to the former pounding -and one more brilliant solo while the orchestra is ever-present, embelishing and even accentuating the overwhelming rhythmm section. An absolute winner. 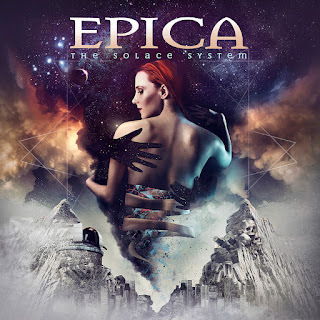 Overall, most of the tracks hold an Epica character and elements of "The Holographic Principle" -sometimes even more than a couple of tracks on the LP but that's a story for an other time. Coen Janssen will never cease to amaze me with his creativity and the way he paints cinematic landscapes -also in the way that both the orchestra and choir have become the unofficial 7th member of the band. When it comes to the basic structure of most songs, the musical background of certain members is pretty obvious. However, at times I get the feeling they tried to combine different ideas into the same song and it doesn't always work out. Take "Kingdom Of Heaven" from "Design Your Universe", for example; it's one of Epica's longest songs and is basically comprised of a song and a half. The final result is so well fused that the listener can easily overlook the length of the song. "The Solace System", on the other hand, appears somewhat non-cohesive; as if different parts were forced together to extract a result. I would also like to make a remark on Simone Simons' vocals. There is no doubt she has pushed many boundaries in her singing over the years and her voice has beautifully developed, as we witnessed here for the most part. In specific moments on the EP, though, she uses a mixed vocal technique -and not exactly effortlessly might I add- which sounds like it pushes her higher register almost to its limits both in terms of range and control over her voice. I really hope "Fight Your Demons" and "Wheel Of Destiny" will find their way into the setlist of the Ultimate Principle tour. It should make their performance even more interesting.